U.R. Our Hope to Visit With Ohio Families! For five and a half years, diagnosis eluded Emma, her family, and her team of medical doctors. Her diagnostic odyssey led her and her family to U.R. Our Hope, an organization that assists families with undiagnosed and rare medical conditions. With the help of U.R. Our Hope, Emma was accepted to a research program at TGEN where she received genetic testing and a diagnosis. In December of 2013, through Whole Exome Sequencing at TGEN, Emma was found to have a mutation in the STXBP1 gene. The mutation causes her brain to have a difficult time communicating with her body, leaving her non-ambulatory, non-verbal, and epileptic. This gene was only recently discovered in 2009, so there is little understood about the gene and its function. As a result, there is currently no treatment and no cure. Despite the challenges Emma faces daily, her mother says “Emma is a light wherever she goes. 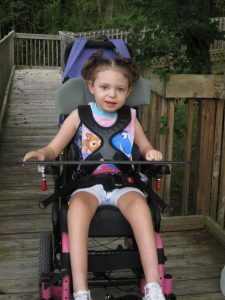 She brings joy to everyone she meets.” Like many 8-year-olds, Emma loves music, reading, swimming, and being outside. Her family seeks to raise awareness for this extremely rare condition and the organization that helped her family on the journey to diagnosis. Emma’s story is just one of many. And she’s one of several families U.R. Our Hope has assisted in the Ohio area. Currently, 30-40% of children with special needs do not have a definitive diagnosis. With over 7,000 identified rare diseases, for many of them, it can take up to 7 years and dozens of specialists to find the rare diagnosis causing their symptoms. U.R. Our Hope seeks to help these families shorten the time spent Undiagnosed by helping families navigate the healthcare system; making referrals to specialized physicians and research programs; and providing financial assistance in the form of gas and meal cards to these families who travel out of town or out of state for adequate medical care. Once diagnosed, many of these families do not have the backing of a national support group for their diagnosis to assist with research, continuity of care, or emotional support. U.R. Our Hope continues to be a beacon of hope for these families throughout the journey and beyond. U.R. Our Hope is based in Austin, Texas, but because they are one of very few organizations dedicated to serving the undiagnosed and rare community, they assist families nationwide. Without a local presence, much of the work is done by phone or email and we do not often have a chance to meet our families in person. This week, is special for U.R. Our Hope because Dr. Mary Elizabeth Parker, founder and medical liaison for U.R. Our Hope, will be in Columbus, Ohio, where she will have the opportunity to finally meet the families she has helped on their diagnostic odyssey. Dr. Parker is a physical therapist who has a passion for undiagnosed and rare diseases. Early in her career, one of her patients passed away undiagnosed. A diagnosis came two days later; a treatable diagnosis. This changed the course for Dr. Parker and has continued to shape her career. While she is in town for the Annual Meeting of the Federation State Boards of Physical Therapy, Dr. Mary Elizabeth Parker will set aside time to finally meet face-to-face with three U.R. Our Hope families from Ohio to discuss their diagnostic journey and how U.R. Our Hope can continue to assist. We are reaching out to local media in hopes of featuring the stories of these families to raise awareness of a largely unknown issue facing many Americans daily.